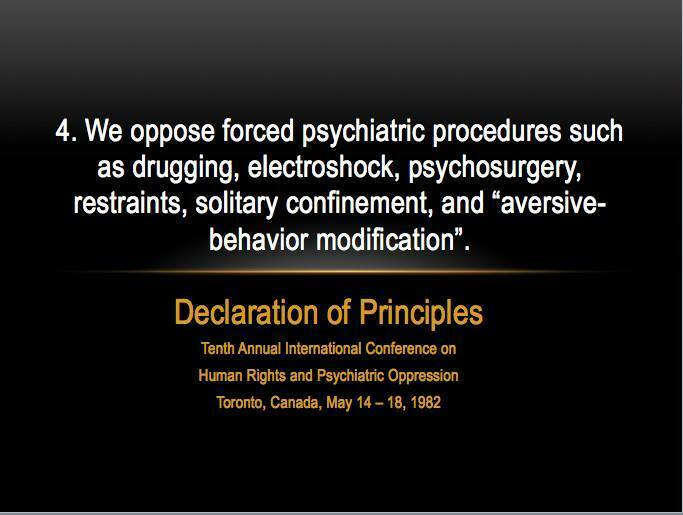 This is Day 4 of our 30-day blog on the Declaration of Principles adopted by the 10th Annual Conference on Human Rights and Psychiatric Oppression held in Toronto, May 14-18, 1982. (More info here.) Today we are talking about Principle 4. 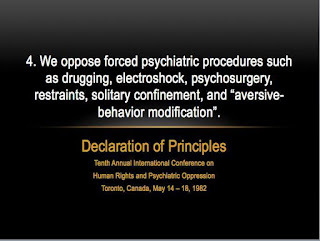 We oppose forced psychiatric procedures such as drugging, electroshock, psychosurgery, restraints, solitary confinement, and "aversive behaviour modification." Force is not treatment. Forced procedures are not treatment. The potential harms from standard psychiatric procedures like neuroleptics, SSRIs, benzodiazepines, electroshock, segregation, seclusion, restraint et al. are vast, well-documented, widely reported and internationally acknowledged. But what about the outcomes? Aren’t they necessary? Aren’t there those times where, truly, the end justifies the means? You hear this all the time - mostly from those on the outside, but also sometimes from the inside as well. It's time to stop conflating compliance with progress. As should be obvious, diminished capacity to think for oneself, the death of a self that can scream or cry, the fear - abject fear - that shuts up or shuts down are hardly outcomes to proclaim from on high. No ethical enterprise would claim this as success. What passes for 'treatment', in actuality amounts to a bald imposition of majority will - the literal overwriting of individual objections and conscience. It represents the obliteration of the personhood - if not the person -- objecting. Far from therapeutic, this usurpation of existence destroys human relationship. It destroys everything of value between human beings. No one trusts, cares, loves, or is truly open to the authentic presence of someone they dread. Equally important, much of human distress or conflict - the the very stuff that gets one labeled a threat to self or others - stems from these kinds of damaged, power-imbalanced social dynamics. All of this points to the possibility - probability - of a better way. It only stands to reason that if balance can be restored, and trust and connection re-established, conflicts will mitigate. People can learn to share space - better, more often, with more mutuality and less disagreement. Given enough time and effort, damage can be repaired and healing can occur. Any system truly interested in mental health and human well-being would give attention to these issues. Not only does psychiatry ignore them, it actively implodes them. It superimposes its own dogma over that of both sides. Insisting on grand-standing its own expertise, it shuts down sincere inquiry, silences discourse, and kills the incentives for reflection and change. Another problem with force is even more integral. The basic justification for yanking our rights is that, in effect, we are no longer seen as fundamentally human. In the essential view of someone with power to decide this, we are little better than zombies - irrational, unprincipled, oblivious - with dubious capacity to reason, make decisions of conscience, respond to the concerns of others or appreciate the values that society holds dear. Even if this is correct (I would argue it is not, that madness has its own values and logic if you care to look), what do we do about it? Well, call me crazy, but if it were up to me and I thought someone was short on capacity, I would look for meaningful ways to support them to build it. For the vast majority, possibly all of us, human growth is not really helped by what psychiatry has to offer. In fact, for the vast majority, the tools of psychiatric trade - neuroleptics, SSRIs, benzos, shock, getting tied down, beaten up, locked away behind closed doors - are all pretty much counter-indicated. 1. Feeling physically and emotionally safe, 2. Comfortable surroundings, 3. Good food, 4. Fresh air, 5. A safe place to sleep and get good rest, 6. Meaningful stuff to explore and do, 7. Supportive friends and allies, 8. Reasonable assurance that our basic needs will be met, now and for the foreseeable future. It would be nice to have a voluntary supports like these – in every community - to grow and develop our collective well being. Indeed, unlike what psychiatry offers, you could argue that these things are pretty much essential to well-being. Equally important, when we get denied these things - like psychiatry routinely does to us - the outcome isn't pretty. All of this goes a long way to illustrating how and why psychiatric interventions amplify and exacerbate the very problems they purport to cure. Where we should be supporting each other to repair capacities or build or grow new ones, psychiatry removes us from our former lives. It destroy and disables the supports we need for living. And, instead of nurturing and resourcing our natural capacity to develop, psychiatry drugs us, shocks us, damages the very living tissues and systems necessary for our growth. In both method and message, psychiatry hinders rather than heals the pathways essential to human functioning. We are building this Blog together. 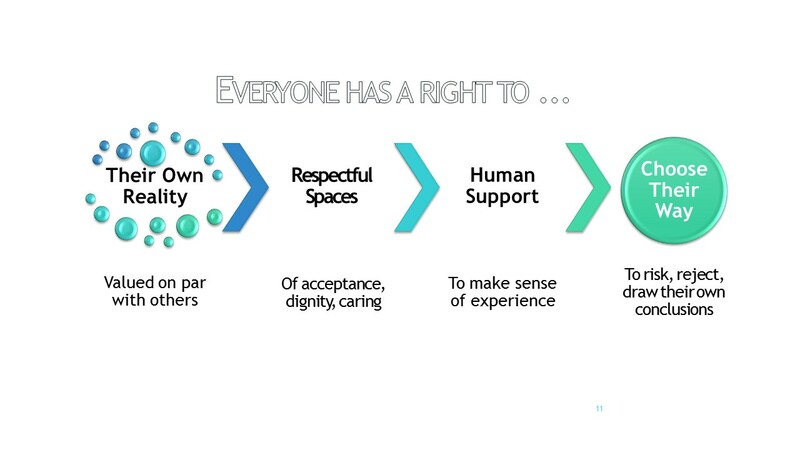 Your lived experience is needed and valued. It is essential to building our shared knowledge and expertise as a movement. Please comment on any or all of these questions or in any way that speaks to you personally. 1. Have you ever experienced the contradiction of force in the name of 'treatment'? 2. What would you like others of conscience to know about your experience? 3. What about this experience affected you the most? 4. How did it impact your relationship with important others? 5. What in your experience most supports your capacity to reason, make sense of experience, and take into account the needs of other human beings? 6. Have you ever been in the presence of someone who you felt was extraordinarily principled, well-reasoned or conscientious? Compare and contrast that to your experience with psychiatry. 7. Think ahead to the advice you would give to future generations. How could we develop our shared capacity to respectfully reason out our differences? 8. Envision a totally voluntary paradigm for human well-being that makes forced psychiatry was obsolete. What does that look like to you, and what would we need to we get there? didn't get to post this yesterday, i see today's (principle #6) focuses specifically on torture but will post this here and share some hr law resources under the specific torture point in a little while. it does not matter if it is a first resort or a last resort. psychiatry may have two faces or only one. it certainly has a face of institutional/public/coercive use of medical knowledge for coercive purposes through and through, as repression outside the penal system to control people who are unhappy or whose needs or beauty or power or destructiveness scare people. people who can't, don't or won't fit into the system and are falling through its cracks. psychiatry per se i see as a phenomenon of capitalism, creating an industry off the governing classes' need to control the population as a whole, people who don't fit can gum up the working of the machine. so we have an industry to process people into being either compliant with the machine or being processed and processed by it until they die. i think you mentioned CRPD in an earlier principle, i see this one as key to the point of forced psychiatry being recognized as torture. it is the harm we experience and its deliberate nature, the deliberate going against our will knowing or having it obvious that we are afraid, terrified, absolutely reject with our whole being this thing that they want to do whether it's a neuroleptic ("nerve-seizing") drug or shock or four-point restraint or solitary confinement, and they get a satisfaction out of doing it in spite of our refusal, they deliberately intend to force us into bodily and mental submission. even those who go to psychiatry voluntarily to begin with know the "culture of compliance" that denies them information, denies the reality of their experience that the drug is making them worse, and then insidiously pressures them to stay with it or outright threatens force if they don't. we have always called this industry and the state in collusion, as a form of violence. naming it as torture under international law makes the connection between the deliberate acts of violence and the collusion of the state. when the state legitimizes violence we are defenseless against it. yes by luck or grace or convergence of circumstance we can fight back once in a while and win, or they get tired of torturing us and stop, or something in the configuration changes that makes it no longer interesting or profitable for them (e.g. insurance runs out). for these reasons i believe that only legal change to take away the collusion of the state in psychiatry, to take away the cloak of legitimacy and the power they have to enforce their vile deeds, will end forced psychiatry. they are cowards like all bullies and all aggressive people, they will get nasty and fight to keep the power they have, keep doing force as long as they can because it's part of their self-image, but they will lose interest and go play some other way when a number of them have to pay steep fines, face public humiliation, go to jail. please see www.chrusp.org Resources page for more information.